Lately, charting the S&P 500 (SPX) has been about as enthralling as reading a washing machine instruction manual. It's continued to trade inside a seemingly endless, whippy range, leaving us free to imagine whatever patterns we want. Thankfully, all is not lost for those of us who write about these things: Apple (AAPL) has been a big hit since I recommended it as a long play on July 8, and continues to please those of us who are invested in the high-tech fruit. Apple made a convincing breakout over resistance yesterday on impressive volume. Apple's now bumping against resistance from the (assumed) A-wave low. This is an important resistance zone, since overlap of that price zone would suggest a three-wave decline -- and that would mean the decline was corrective, which would then suggest Apple is ultimately headed back into the 700's. Some folks believe that technical analysis is a bunch of silly mumbo jumbo -- I would point at my Apple charts of the past few months as a strong hint to those folks that they're missing out on a powerful trading tool. I first called attention to Apple back in May, and it rallied briefly thereafter, at which point I told readers I would not want to remain long if it traded below 442. It did so, and then proceeded to drop 50 points. 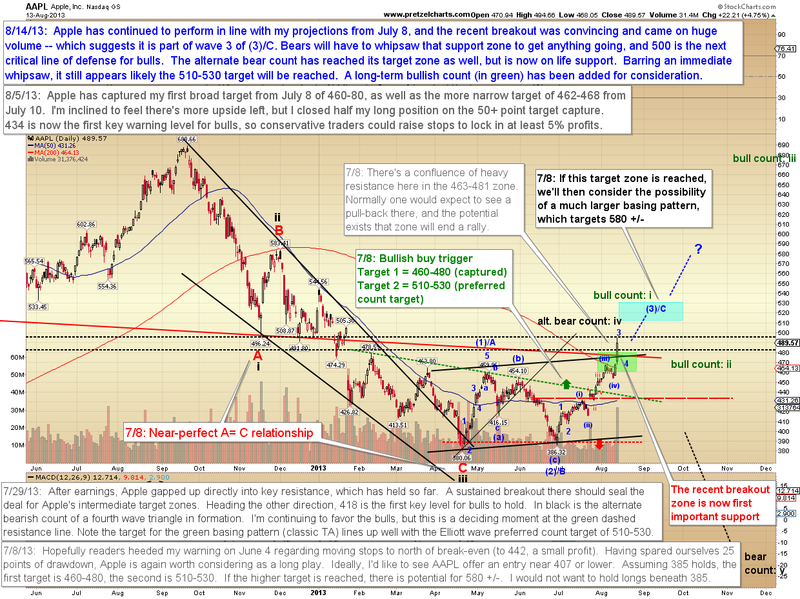 From there, I projected the the dip on July 8, which I recommended as a buy, with a first target of 460-480 -- and the rest is history. All of this has been done simply by reading the charts. Obviously, I didn't have insider information allowing me to project that Apple would jump 5% on its earning announcement, and another 5% on Icahn's buy recommendation. There was no way I could know these things -- but someone was buying (and we now know at least one of those big players by name), and that buying left patterns in the charts which pointed to higher prices. As I've asserted for many years: the charts lead the news. If you're lacking technical analysis in your trading arsenal, you're missing a fantastic tool. As noted, bulls aren't entirely out of the woods just yet, but given yesterday's solid breakout, the picture continues to look promising. 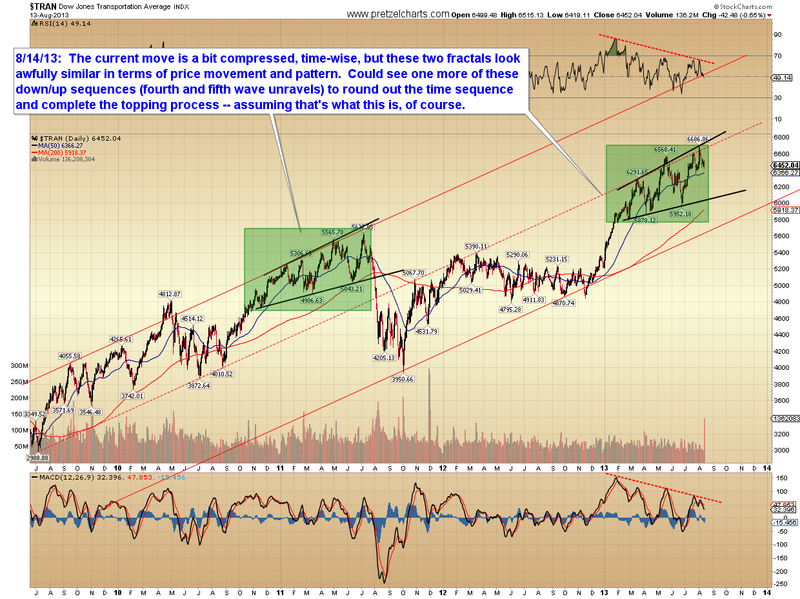 In reviewing my chartbook tonight, I realized a minor oversight on the NYSE Composite (NYA). 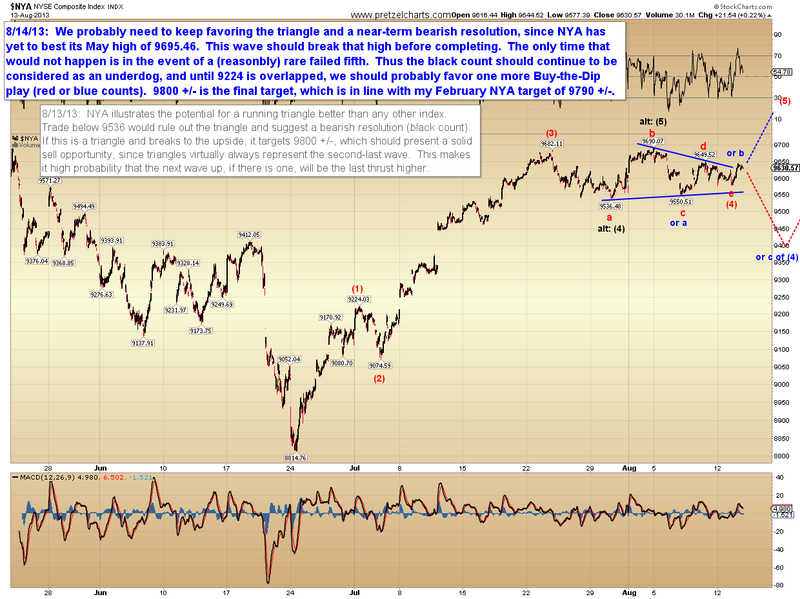 NYA hasn't broken the May high yet. I've been leaning toward the idea that there would be another wave up to wrap up the pattern for the near-term, and this realization puts me more strongly in that camp. 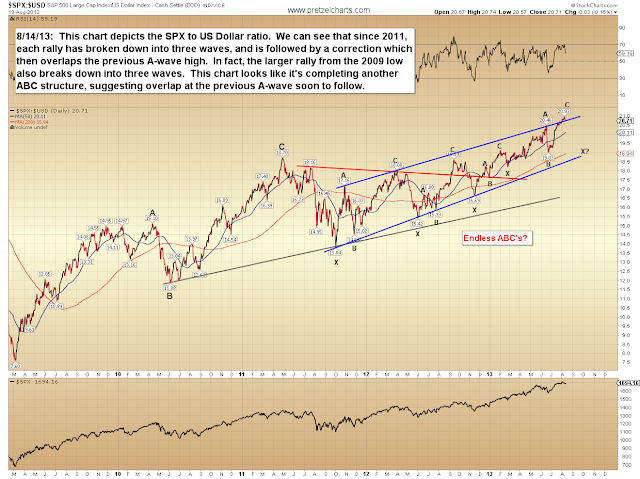 Intermediate term, I continue to believe this is will mark the final wave before a solid correction. The Dow Jones Transportation Average (TRAN) looks to be in the process of forming a topping pattern. 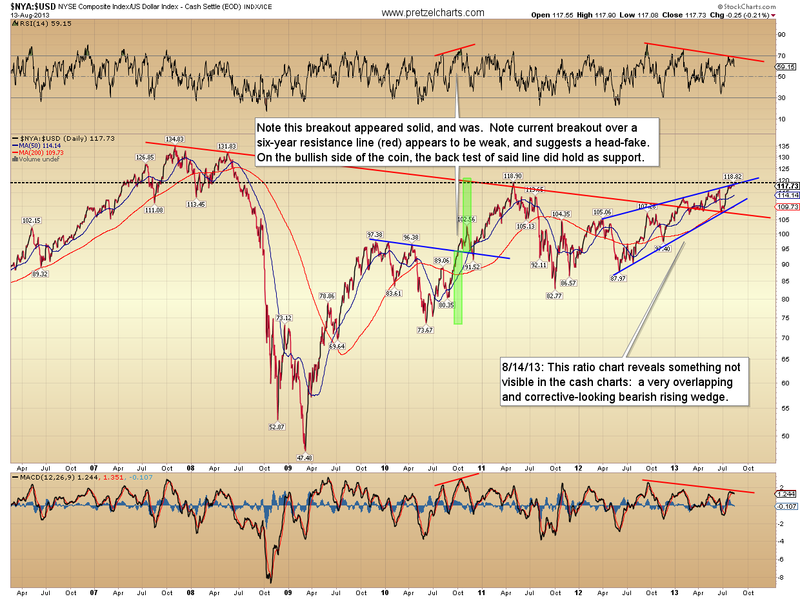 For SPX, the blue box target from last month remains active, and I suspect it will ultimately be reached. 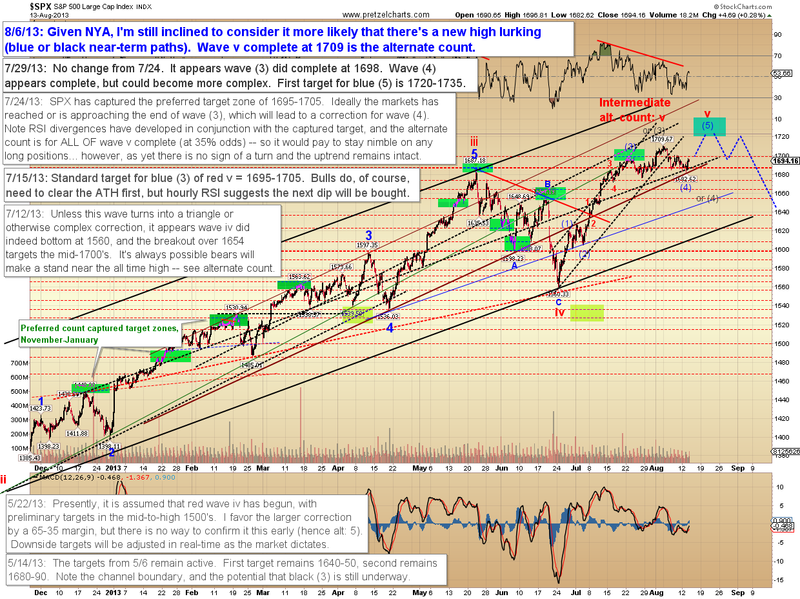 The market has two near-term paths it could take to reach that target. I'd like to share a couple of interesting ratio charts I use. Both are ratios of equities indices to the US Dollar; my theory being that in a QE Printing Press World, the dollar is pretty important. 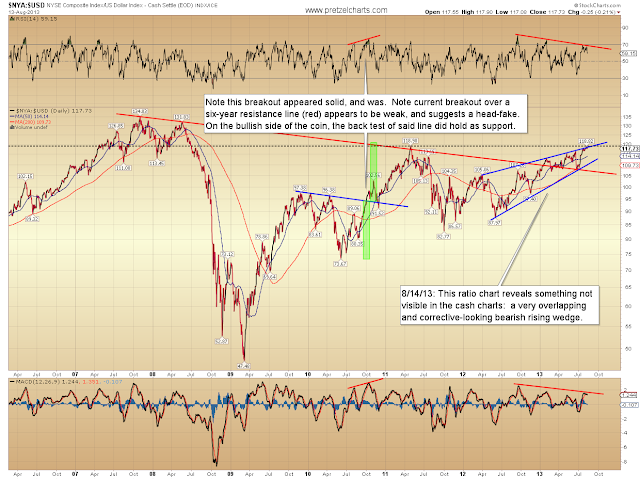 Since it's not always correlated to equities, I chart the patterns the two form when viewed as a whole. 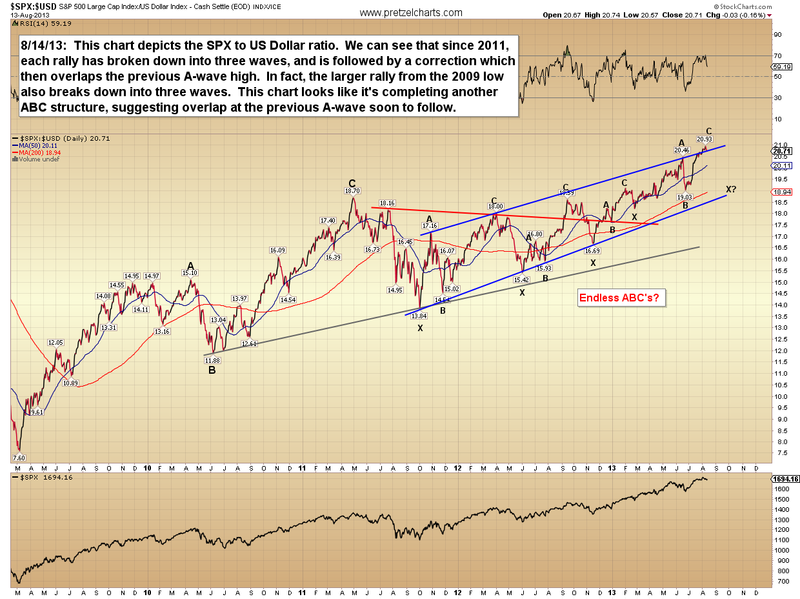 The first chart is SPX to the US Dollar, and the second is similar but uses NYA. In conclusion, the market has remained range-bound, and therefore making a near-term call is a bit risky -- nevertheless, I'm inclined to favor the view that bulls get another new all-time-high to notch into their printing presses before bears get a shot at a decent correction at intermediate degree. However, this is likely to be just a correction, meaning the bull market will then resume afterwards. Trade safe. Article originally written (by me!) for Minyanville; Reprinted by permission; Copyright 2013 Minyanville Media Inc.